One of the most common reasons why a lot of businesses fail is because they weren’t able to plan their marketing strategy. The basis for all good marketing and sales performance is when a business or startup has a strong plan in place that they can follow and build on. If you don’t have a marketing strategy, then you should expect to waste time and money while also losing your sales message. Many small business owners are guilty of neglecting their marketing strategy because they are too busy dealing with the thousands of other issues to run their business. Many other business owners don’t use the tools they need to reach their goals because they worry about spending a lot of money, but there are many great free small business marketing tools available for you to use. While you have many things to consider when it comes to your business, marketing and operations should be among the most important. This is especially true if your business is just starting out because you need to develop your online presence, grow your brand, and systemize driving qualified leads to your website to boost conversions. To help you on this path towards increased sales and revenue, I put together a list of the top marketing mistakes I see startups and small business owners make. These errors are often innocent oversights, or simply the result of inexperience. However, these errors, if unchecked, can lead your business down the path of wasting valuable time and resources. Because entrepreneurs are self-starters, when we talk about marketing, it’s no surprise that most of them would go the easy route to save time and effort. The #1 way most businesses try to build their marketing approach and messaging is by copying what has already been established by their competitors. Instead of copying your competition, you need to find ways to leverage your strengths and fill in the gaps of your market. This can come in many ways, ranging from offering better services, tailoring to specific needs of a niche audience, and offering other products that your competition does not currently provide. The best way to learn what your customers are looking for is to perform keyword searches and understand their intent. You should also interview their clients to learn firsthand what their problems and desires are and the products/services they are currently using to find ways to offer a better set of solutions for their needs. By doing so, you’ll be able to come up with a marketing message that would allow you to stand above your competitors. The level of differentiation that your business needs to have begins with your overall messaging. If you are just starting your business, then you need to focus on differentiating yourself more than an established company, but even if you have been around for awhile then you will need to build an online presence that meets the needs of your customers. Planning, creating, optimizing, and producing content is not easy, nor is cheap. In fact, depending on the platforms and channels that your business is marketing could show significant costs. However, if you create a marketing plan before producing content, then you will find that your costs are investments because your business will be able to make money from your efforts. Your marketing strategy is crucial because it serves as a blueprint for how you’re going to deliver your objectives to your target audience. You have to create a compelling case that would influence your customers to check what you have to offer. A well-thought plan to promote your business on a given time frame. Based on the needs of your target audience. Formed around the current state of your market and industry. Addresses gaps in the market, especially in how you approach your competitive advantages. Creating a marketing plan requires you to have a better understanding of the average customer’s value and lifetime, as well as the costs related to the new client acquisition and the difference between a desirable customer to those who would just waste your time and effort. Before launching a campaign specially made to reach your new clients, it’s essential to have an idea about their activities. Try to determine if it would be more practical to concentrate on improving the loyalty of existing customers or something else. As you take a look at the financial results and analyze the usual amount spent with each client, you’ll have an idea of how much you can make and which marketing strategies would work best. By being familiar with profit margins on certain products and services, you’ll be able to formulate a referral system, loyalty program, or one-of-a-kind promotions that won’t take much of your budget. Ideally, businesses, especially startups and small businesses, need to know a customer’s individual preferences or their purchase history can also be of great help. Unfortunately, you cannot always rely on this pattern, especially if you already have a huge company or new customers. Either way, what we’re trying to say is that the crucial element if you want to satisfy your customers, and be able to plan future business activities, is to focus on these. Once you start generating data and sales, you should concentrate on the record and find patterns that you can use to understand the needs of your customers. This information is not only helpful when you need to review past performance, but it can also help you identify key demographics and business opportunities moving forward. A marketing plan should contain your social media strategy, such as being able to identify the location of your target audience. This would help you diversify your social media activity and be able to cover a broad span of platforms. If done correctly, you’ll have a mix of customers coming from different channels, and in case something goes wrong, you wouldn’t have to start from zero. Additionally, you should exert some time, effort, and dedication in understanding both the disclaimers and disclosures that should be followed. Social media is a great way to spread your message and connect with your target audience on a personal level. However, many businesses forget that social media is meant to be social, so you need to tailor your messaging and approach based on each platform and the demographic if your customers. Too many businesses blast their message on social media and forget that their efforts are better spent creating personal and approachable content that will entice their customers to visit their website or other content. Just like what most professionals say, good marketing yields positive results. Inability to measure it would make it impossible for you to determine what went wrong, and you’ll be stuck in the dark. If it is important, then you should should measure it, and digital marketing is the perfect area to measure results because you can track almost everything about your marketing efforts. Fortunately, most social media platforms nowadays come with built-in analytics, as well as tracking tools that can help you check the status of your blog posts, tweets, ads, and so on. The same goes for PPC, SEO, website traffic, and email marketing. All of these platforms allow you to identify what is working and optimize your approach based on how your customers interact with your content. You could also utilize promo codes, unique URLs, CRM platforms, online customer survey tools to accurately quantify the results of your campaign. 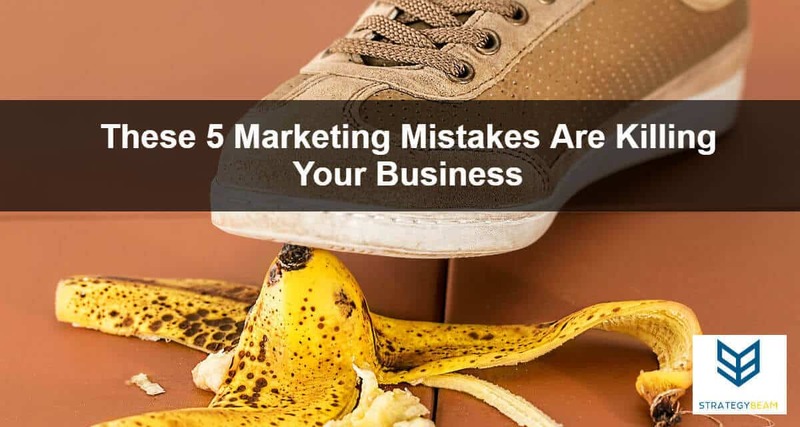 Now that we covered the top 5 marketing mistakes that many small business owners and entrepreneurs make, you should evaluate your current marketing plan to find ways to improve your sales and outreach. If you don’t have the time to run your own digital marketing strategy then you should consider hiring a professional. As a Digital Media Strategy Consultant, I have over 13 years of experience working with business owners just like you. Now is the time to stop guess and start closing more sales with amazing digital marketing. If you are ready to grow your business and boost your sales, then take 25 seconds to fill out the form below and we will follow up with you ASAP!